All the options that can be configured will be reflected in the Calendar Application. Margins : Allows you to arrange the display of the application in the page, according to the values entered in the margins. These values must be informed in pixels. Form Iframe Width : Allows you to set the form width that will open in the calendar application. These values must be informed in pixels. 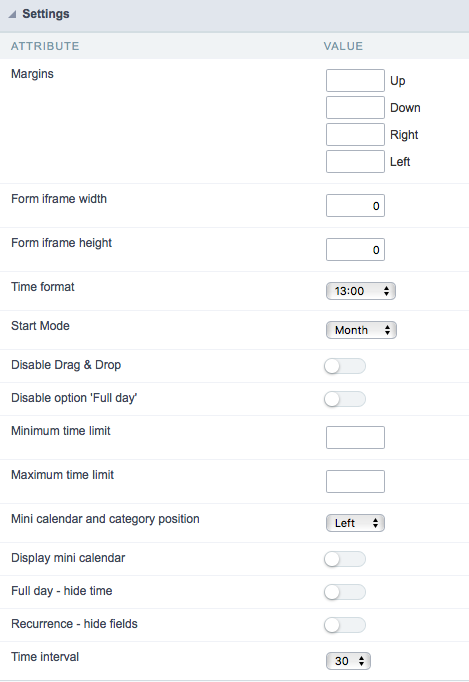 Form Iframe Height : Allows you to set the form height that will open in the calendar application. These values must be informed in pixels. Time Format : Allows you to choose which time format you want. You can choose between “13:00” (24 hours) or “1:00 pm” (12 AM / PM). Start Mode : Allows you to choose how the calendar will start. The list of events can start in month, day, week, or calendar. Disable Drag & Drop : Allows you to disable the option to drag events to other days or months. Disable option ‘all day’ : Allows you to disable the ‘All Day’ option when registering an event. This option is available in the calendar form. Minimum Time Limit : Allows you to limit the minimum time displayed in the Week and Day tabs. Maximum Time Limit : Allows you to limit the maximum time displayed in the Week and Day tabs. Mini calendar and category position : Allows you to position the mini calendar and category in the generated application. This positioning can only be done together to the left or right side. Display mini calendar : Allows the display of a mini calendar to navigate independently from the main calendar. Full day - hide time : Allows you to hide the time fields when the “whole day” is selected in the generated application. 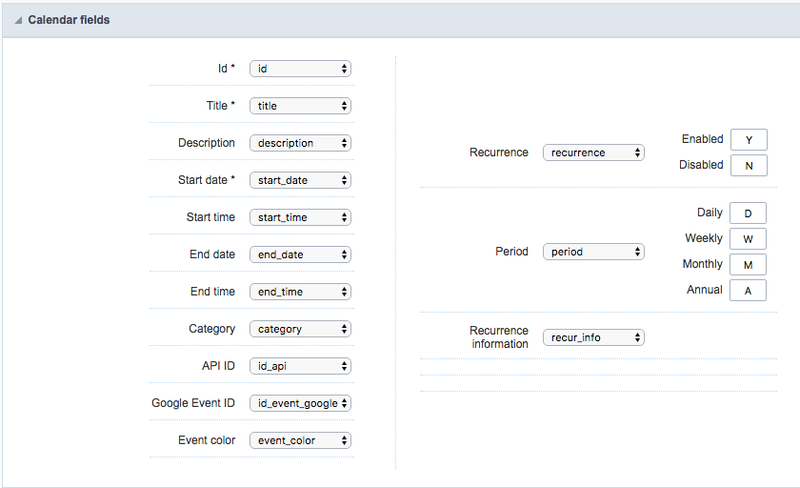 Recurrence - hide fields : Allows you to hide period fields and recurrence information in the generated application. Time interval : Allows you to enter the time interval you want to display on the calendar in week or day mode. This interface displays the fields relationship that will be used in the application. You need to relate the table fields to the form application fields. The Google Calendar API will allow you to synchronize your Google calendar with the application developed in Scriptcase. First you must activate the Google Calendar API by clicking on https://console.developers.google.com/apis/api/calendar-json.googleapis.com/overview. 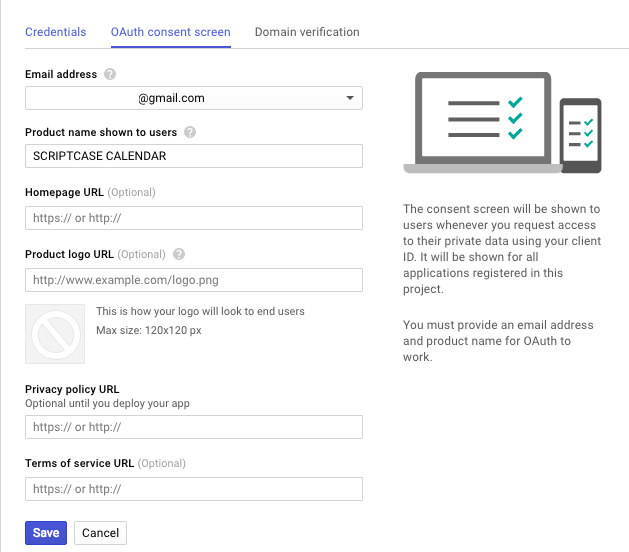 After activation you need to configure the “OAuth consent screen” by clicking on https://console.developers.google.com/apis/credentials/consent. E-mail Address : Select the email that will be used as the source for the google calendar. The application will use this data for synchronization. Product name shown to users : Allows you to enter the consent name that will be displayed to the clients. Make sure the name accurately describes your product and be careful not to use names that suggest that the product is from Google or another company. Note: You only need to inform the e-mail address and the product name. All other items are optional. Select the “Web Application” option and follow the setup below. Name: Enter a name for the OAuth client ID. Authorized redirect URLs : Enter the full URL until your calendar application. Now let’s configure the Scriptcase application. Integrate with Google Calendar: Synchronize with Google calendar events, allowing you to import or export events. 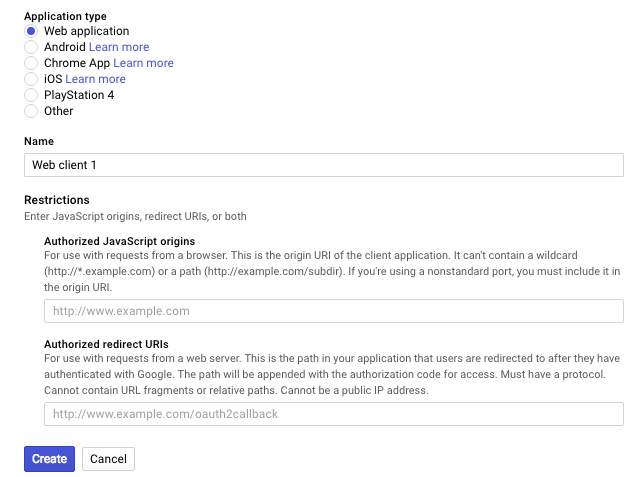 OAuth Client Json : Json from Google OAuth with the credential to access the project. To get this content, open the OAuth Client ID of the previously configured OAuth__ client and download the JSON. Login on Google OAuth : Choose if you want to store the login made in the application to not ask again or if you will request session authentication. 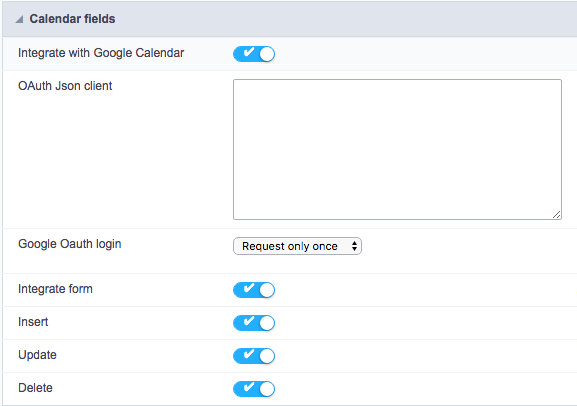 Integrate form : Enables the form to insert, delete or update events in Google Calendar. Insert : When inserting an event in the form, it also inserts in google calendar. Update: When updating an event on the form, it also updates in google calendar. * Delete: When deleting an event in the form, it also excludes in the google calendar.